There are fears that some Victorian schools may have to axe the Victorian Certificate of Applied Learning (VCAL) option for Year 11 and 12 students after the Baillieu government announced a cut of $12 million from the program per year. Each state secondary school offering the program may lose up to $126,000 in funding to coordinate the program — funding that is used to cover activities such as planning and developing the curriculum and coordinating student placements with employers. 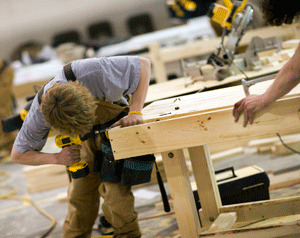 VCAL provides an alternative to the VCE for students who wish to go on to employment or vocational training after school, rather than university. The program caters for disengaged students deemed to be at risk of dropping out, and a number of critics have questioned the removal of funds from an area that supports some of the state’s most disadvantaged students. According to Australian Education Union president, Mary Bluett, ''Small rural schools will be the hardest hit because they don't have money they can take from other programs''. The most recent state education budget announced a cut of $481 million over the next four years, and the Baillieu government has already been accused of cutting funding in areas that support vulnerable students, with the axing of literacy and numeracy coaches and Koorie education specialists. According to Skills Minister Peter Hall, the $12 million allocated to schools to coordinate the program was ‘additional’ funding — intended only to support the establishment of the program — that is no longer required now that the program is well established. Mr Hall said that every student completing the program would continue to receive funding. ''There is no reason why any student should be disadvantaged by this measure,'' he said. VCAL was introduced in 2003 to reduce the number of young people from dropping out of school. About 18,000 students are enrolled in VCAL. Catholic and government schools and TAFEs that offer the Victorian Certificate of Applied Learning are currently eligible for between $12,000 and $126,000 a year, depending on the number of students enrolled. For more information on VCAL, click here.